Greville Janner and Margaret Moran – trial of facts more likely for expenses fiddling than child abuse? In 2012, the former Labour MP for Luton South Margaret Moran faced 21 charges of false accounting and forgery of parliamentary expenses involving sums of over £60 000. However, following a psychiatrist’s report, Moran was found to be suffering from a depressive illness, with extreme anxiety and agitation, and as such was unfit to stand trial. Nonetheless, a trial went ahead in her absence (a so-called ‘trial of the facts’) and it was found that she did indeed falsely claim more than £53 000. Moran received a two-year order placing her under the supervision of a council mental health social worker, as well as being treated for the improvement of her medical condition. At the time, the Director of Public Prosecutions (DPP) and Head of the Crown Prosecution Service (CPS) was Keir Starmer, now the Labour MP for Holborn and St Pancras after being elected in May 2015. Fast-forward to two-and-a-half years after the trial of the facts for Moran, and as is now well-known, the new DPP, Alison Saunders made the decision not to charge Labour peer Lord Janner, formerly Greville Janner, MP for Leicester West from 1970 to 1997, with 22 offences involving the sexual abuse of children, between 1969 and 1988, on the grounds of his suffering from dementia. Even the Mayor of London, Boris Johnson, argued that Janner should face a ‘trial of the facts’, but Saunders dismissed this on the grounds that Janner was no longer an ongoing risk to the public (not something which Janner himself would have viewed as an obstacle to prosecuting Nazi war criminals with dementia, as witnessed by his statements here and here). Starmer defended his successor Saunders’ decision, saying that ‘we should inhibit our comments on the case’. There have been major questions asked about the reliability of the diagnosis of dementia against Janner, in light of clear evidence of much significant activity at the House of Lords and elsewhere following the initial diagnosis (see for example this report – as Gojam has pointed out on The Needle Blog, there is a great irony in Janner being deemed too ill to face justice but well enough to legislate). But even if one accepts that Janner is not fit to appear in court, do the seriousness of the charges (not to mention the suggestion that Janner may have been part of a wider network, together with the former Speaker of the House of Commons George Thomas aka Lord Tonypandy) not make the case for a trial of the facts imperative? Janner may not be an ongoing risk to the public, but neither was Moran, who was no longer an MP at the time she faced charges. I do not want to make light of the issue of MPs fiddling parliamentary expenses, though do think that as financial scandals go, this was quite small in terms of the sums involved, especially relative to government spending. Furthermore, I do not share public cynicism about the very profession of being a Member of Parliament, and think our MPs should be paid more, commensurate with the salaries they might receive in the private sector, and hopefully then few would want to fiddle expenses. The spectacle of a clearly distraught and destroyed (and visibly aged) Moran, following the court ruling, was something I found upsetting at the time. This has nothing to do with her gender; the vilification and imprisonment of Denis McShane was no less pretty, nor was the SNP-driven hate campaign against the vulnerable Charles Kennedy, likely playing a part in his early death. But I believe there are current and former MPs against whom far more serious charges exist. The fact that parliamentary expenses has been viewed as a more serious matter than the abuse of vulnerable children says a good deal about the distorted moral compass that exists in the circles of power. The case for a trial of the facts against Janner is unanswerable. Anything less will smack of a high-level establishment cover-up. It is vital that in this case the truth is established whilst the alleged perpetrator is still alive. This is far more serious than any expenses scandals. A blog post from March which I have only just seen – essential reading on the bullying culture at music colleges. Charlie Hebdo. 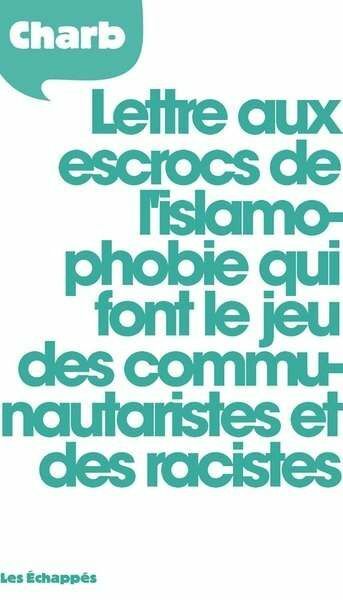 Lettre aux escrocs de l’islamophobie qui font le jeu des racists. Charb. Review Article. A vital review article of the final writing by Charb, editor of Charlie Hebdo, before he was murdered in January. Coates is amongst the vital but increasingly beleaguered voices on the Marxist left who continues to fight for the possibility of real critique, satire and freedom of speech in the face of many neo-Stalinists who seek to censor anything which upsets their fragile, reified, and class-free identity politics. Lettre aux escrocs de l’islamophobie qui font le jeu des racists. Charb. Les Échappés. 2015. The Lettre addresses the reader, “If you think that criticism of religions is the expression of racism” “If you think that ‘Islam’ is the name of a people.” “If you think that punishing blasphemers will open the gates of heaven for you.” “If you think that left-wing atheists play into the hands of fascists and xenophobes” “If you think that it is essential to classify citizens according to their religion” “If you think that one can laugh at everything except whatever is sacred to you.” “If you think that popularising the concept of Islamophobia is the best way of defending Islam” ………..